Places to Visit: Chennai - Mahabalipuram - Pondicherry - Chidambaram - Kumbakonam - Tanjore - Trichy - Madurai - Thekkady - Kumarakom - Cochin. Evening arrive at Chennai International airport. Chennai, formerly known as Madras, this 369-year-old city is the capital of the southern state of Tamil Nadu and is India's sixth-largest city in terms of population with an estimated population of 7.45 million (2005). It serves as one of the main gateways to South India and has a thriving local culture and art scene and is one of the major destinations for medical tourism. It is considered as one of the world's fastest growing cities although ranks 13th in terms of cleanliness. It is on the Coromandel coast of the Bay of Bengal and has the second longest beachfront of any municipality in the world. On arrival meeting, assistance at airport by our representative and transfer to hotel. Where our executive will explain the travel plan in detail and hand over the essential documents (Tour programme, hotel's vouchers, feedback report etc) to you. Rest of the day free for leisure activities. Overnight at hotel. After breakfast at hotel visit The British east India Company's St. George Fort is a famous landmark of Chennai. Another colonial structure in the city of Chennai worth visiting is the Santhome Cathedral & Marina Beach. Later in the afternoon drive to visit Mahabalipuram. Mahabalipuram - The religious centre of Mamallapuram (formerly Mahabalipuram) was founded by a 7th-century-CE Pallava king, Narasimhavarman, also called Mamalla ("great wrestler"), for whom the town was named. On arrival, check in hotel. Rest of the day free for leisure activities. Overnight at hotel. After breakfast at hotel enjoy full day guided city tour including visit shore temple & Pallava Cave - The standing testimonial to the rock cut art, also visit Arjuna's Penance, Krishna Mandapam, Five Rathas and beach. Evening free for leisure activities. Overnight at hotel. After breakfast at hotel drive to Pondicherry. Pondicherry is the erstwhile French colony now a union territory India. On arrival check in at hotel. After wash and change at hotel visit Auroville -A real example of community living and gradually flourishing, Auroville is conceived as a ‘Universal Town’. This is a place were people with different nationalities; beliefs and culture live in harmony. This amazing city of community living was started in 1968 by the Maa, renowned disciple of Shri Aurobindo, also visit Aurobindo Ashram, Pondicherry Museum and sculpture gallery with an outstanding collection of artifacts. Rest of the day free for leisure activities. Overnight at hotel. After breakfast at hotel drive to visit Chidambaram. Chidambaram is among the most venerated towns in the Southern India. The sacred city has some of the finest of the architectural marvels that its famous temples reflect. Later visit Kumbakonam is one of the oldest towns in Tamil Nadu and is famous for its Mahamaham festival. In the 7th Century it was the Capital of Chola Kings. 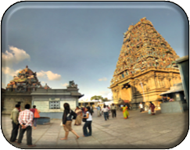 Kumbakonam, the famous temple town of South India, is picturesquely located amidst the two rivers, Cauvery & Arasalar. Continue your drive to Tanjore. Tanjore is the "Rice bowl of Tamil Nadu" and famous for the Brahadeeswarar Temple. The temple was constructed more than thousand years ago by the King Rajarajan, is an architect's marvel. It is a flourishing centre for bronze sculpture and painting. Thanjavur was the royal city of the Cholas, Nayaks and the Mahrattas. Thanjavur was at height of its glory during Rajaraja Cholan. The Big Temple and the other famous temples in the district are known all over the world. Thanjavur was the cultural capital of the country in 1790. On arrival, check in at hotel. Rest of the day free for leisure activities. Overnight at hotel. After breakfast at hotel visit Brahadeeswara Temple - Sculpture of Nandi (Bull) & Royal Palace Complex. Later drive to Trichy. Trichy was the citadel of the Chola dynasty in the medieval period. In the 18th century it witnessed the Carnatic wars fought between the French and the English. On arrival visit Â Lord Robert Clive's house, Srirangam Temple & Rock-Fort Temples. Continue drive to Madurai. Upon arrival, check in at hotel. Rest of the day free for leisure activities. Overnight at hotel. After breakfast at hotel visit Sree Meenakshi Temple, one of the most prominent temple dedicated to Lord Shiva who was known here as Sundareshvara and his wife Parvati or Meenakshi, Thirumalai NayakÂ Palace, a magnificent palace that was built by King Thirumalai Nayak with valuable assistance of an Italian architect in the year 1636. Gandhi Museum & Thirupparankunramfamous for the Pandyan rock-cut shrines that date back to the 8th century that later came to be known as the Nayaka Hindu temple. You will find a wide range of Hindu deities carved on the walls on your visit to this temple. Evening one can watch night ceremony at Sree Meenakshi Temple. Rest of the day free for leisure activities. Overnight at hotel. After breakfast at hotel drive to Thekkady. (Periyar National Park) - Set high in the ranges of the Western Ghats, in Kerala, is the Periyar National Park and Tiger Reserve. The park has a picturesque lake at the heart of the sanctuary. Formed with the building of a dam in 1895, this reservoir meanders around the contours of the wooded hills, providing a perennial source of water for the local wildlife. Herds of elephant and sambar, gaur and wild pigs wander down to the lake-side and can be observed from the launches that cruise the lake. On arrival check in hotel. After wash and change at hotel enjoy boat ride at Lake Periyar to explore the wildlife inside the Park. Overnight at hotel. After breakfast at hotel drive to Kumarakom. Kumarakom is a cluster of little islands on the Vembanad Lake, and is part of the Kuttanad region. The bird sanctuary here, which is spread across 14 acres is a favourite haunt of migratory birds and an ornithologist's paradise. Egrets, darters, herons, teals, waterfowls, cuckoo, wild duck and migratory birds like the Siberian Stork visit here in flocks and are a fascinate the visitors. On arrival check in hotel. Rest of the day free to explore the natural beauty of this town. Overnight at hotel. After breakfast at hotel drive to Cochin. Kochi (colonial name Cochin) is a vibrant city situated on the south-west coast of the Indian peninsula in the breathtakingly scenic and prosperous state of Kerala, hailed as 'God's Own Country'. Its strategic importance over the centuries is underlined by the sobriquet Queen of the Arabian Sea. Informally, Cochin is also referred to as the Gateway to Kerala. On arrival meeting, assistance at airport by our representative and transfer to hotel. Later in the evening visit to watch traditional Kerala Kathakali dance Show. Overnight at hotel. Kathakali dance - It is Kerala's very own, much celebrated dance drama. Kathakali evolved in the 8th century from 'Ramanattam' a dance drama created by Kottarakkara Thampuran, a great admirer and promoter of traditional art forms. Kathakali draws its theme from the wealth of Indian mythology and folklore. The performer is assisted by vocal and percussion accompaniments while the dancer through 'hasta mudras' or hand gestures expounds the theme. Expressions of face and eyes hold the key to perfection. Unique among the Indian dance forms, Kathakali ranks high among the Indian dance forms. Noted for its archaic costumes, weird make up, the elaborately painted faces often mistaken for masks and grand headgears, Kathakali is perhaps the only dance form in India in which the masculine aspect of the dance is preserved in its elemental vigor. After breakfast at hotel visit Mattancherry Palace -The Dutch Palace exhibits beautiful mural paintings that depict the scenes from Ramayana. Fort Kochi -Fort Kochi is inhabited by Anglo-Indian community. The whole of the region presents a different aura and ambience. The culture is quite unique and represents the Eurasian culture. St Francis Church -This church was built by the Portuguese in the year 1503 A.D. It is said that Portuguese explorer Vasco-da-Gama was originally buried here and his remains were later brought to Lisbon. Santa Cruz Basilica -Built by the Portuguese around 500 years back, the Santa Cruz Basilica is known for its Gothic exterior with soaring spires. Also visit Chinese fishing net. Later in time transfer to airport to board on flight for onward destinations.